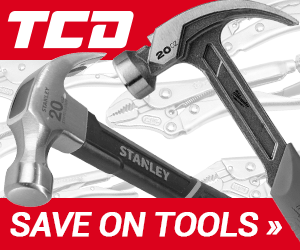 Trade Counter Direct (TCD) started out in 2009 selling a few tools on Ebay and we now specialise in power tools and plumbing tools and have the largest range of access panels online. We have 35,000 products including tools for all trades, consumables, access panels, drain equipment, accessories and much more. Follow Trade Counter Direct to get news updates and products on your homepage. Trade Counter Direct is being followed by 0 people. Trade Counter Direct is currently ranked 877 in the directory. Last month its rank was 1209. 31 products added to Trade Counter Direct 2 days ago. 15 products added to Trade Counter Direct 5 days ago. 17 products added to Trade Counter Direct 8 days ago. 11 products added to Trade Counter Direct 12 days ago. 302 products added to Trade Counter Direct 15 days ago. 28 products added to Trade Counter Direct 24 days ago. A Special Offer was added for Trade Counter Direct: Our Clearance Deals, up To 70% Off, only ... 35 days ago. 11841 products added to Trade Counter Direct 39 days ago. A Special Offer was added for Trade Counter Direct: Spend £150 Get £10 Off Your New Order ... 50 days ago. A Special Offer was added for Trade Counter Direct: Spend £250 Get £15 Off Your New Order ... 50 days ago.